This is all great news to me because I live here. I’ve built a home in the protein world. I’ve built a home out of which I push the boundaries of protein cooking. I do it through this website, the Protein Pow App app, various magazines, my cookbook, and ebooks. I’m all about promoting protein powered cooking. So I’d like to invite you to familiarize yourself with the big dogs out there. 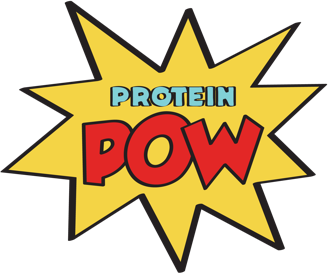 I’d like you to get to know them, to explore what they have to offer, and, in general, to check out all the goodness that’s appearing in this brave new world of protein POWer. Start here: with this recipe. It combines two absolute sensations: a protein blondie from The Protein Bakery and some protein ice cream from WheyHey. I munched this with a friend today post-workout and not a single word was exchanged between us. It was a battle of the fork and we downright DEMOLISHED it. It was so delicious – the hot cakeyness against the cold ice cream, the chocolate melted inside and on top… the whole thing: fwaaaa. We heated up the Protein Blondie and then we topped it with a scoop of protein ice cream and a square of melted dark chocolate. That’s it: three ingredients. I swear, this tops ANY commercially-available protein dessert you can get your hands on. I dare you to find something better. Because the blondie in and of itself is ludicrous. It contains sugar and butter, yes, but it tastes like heaven on a plate. It had white and dark chocolate inside and when that melts? Oy… Sweet-Mount-Olympus-and-all-the-Gods-that-have-ever-stepped-foot-on-it! It’s magical. Couple that with the creamy protein ice cream and you experience a nommage unlike any nommage you’ve ever experienced. So intense…. so deep… so rich… so…. Click on the pics to get the full shoot.